Rent apartments and houses in Fort Lauderdale, Florida with private pools. Book affordable holiday rentals that are near a beach and golf course. With a private, lush tropical garden and pool oasis, modern designed interior, and superior location, this immaculate and open-concept house is perfect for couples, groups of friends and families. This 2 bedroom apartment is located in Fort Lauderdale and sleeps 4 people. It has WiFi, parking nearby and air conditioning. This 3 bedroom apartment is located in Fort Lauderdale and sleeps 6 people. It has WiFi, parking nearby and air conditioning. This 4 bedroom house is located in Fort Lauderdale and sleeps 12 people. It has WiFi, parking nearby and air conditioning. This 3 bedroom house is located in Fort Lauderdale and sleeps 10 people. It has WiFi, parking nearby and air conditioning. 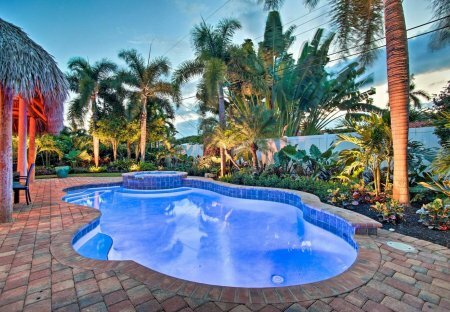 This 3 bedroom house is located in Fort Lauderdale and sleeps 9 people. It has WiFi, parking nearby and air conditioning. This 4 bedroom house is located in Fort Lauderdale and sleeps 10 people. It has WiFi, parking nearby and air conditioning. This 3 bedroom house is located in Fort Lauderdale and sleeps 6 people. It has WiFi, parking nearby and air conditioning.